The government today summoned Myanmar’s envoy to Dhaka and expressed deep concerns over the persecution of Rohingyas in the Rakhine state. Additional Foreign Secretary Kamrul Ahsan handed a note verbale to Myanmar envoy Myo Myint Than in a meeting that took place from 3:15pm-4:00pm. Myanmar has also been urged to take immediate steps to take back the Rohingyas who have entered Bangladesh in recent times, sources inside the ministry said. 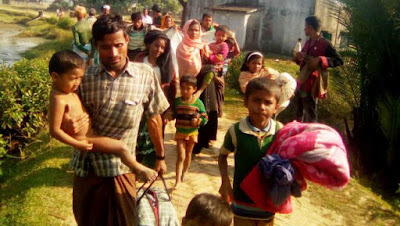 Bangladesh is not accepting refugees from Myanmar at the moment as border guards are on alert in the coastal areas pushing back the arriving fleet of Rohingyas daily.